Commercial deadbolts are in stock in Bright Brass, Antique Brass, and Satin Chrome. Residential Deadbolts are in stock in Bright Brass, Satin Nickel, and Satin Brass Blackened (duro). As tough as a Maxum® deadbolt is on the outside, it’s that smart on the inside. 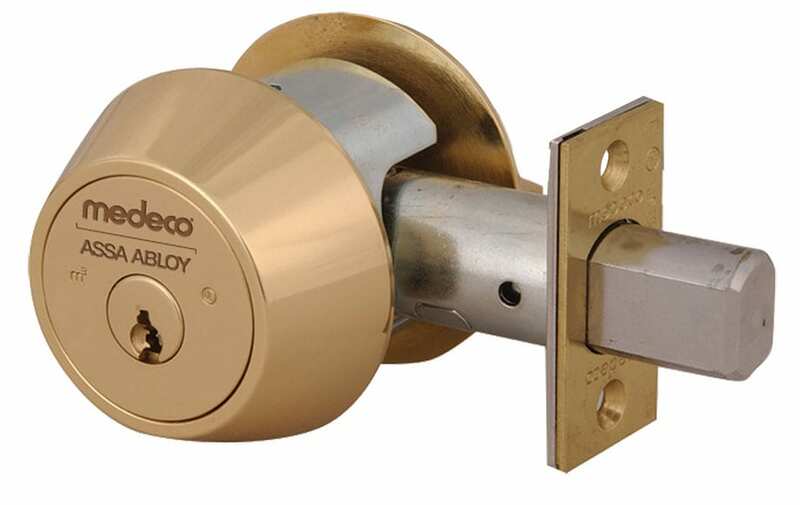 It features the triple-locking security of a Medeco3® cylinder and offers the security of UL437 Listed key control. Recommended for residential and business use, it?s available as a single– or double–cylinder or with a unique “captive thumbturn” feature. The captive thumbturn converts the inside cylinder to a thumbturn for safe exit when the facility is occupied. A quick conversion when the facility is not occupied returns it to double cylinder mode and guards against unauthorized entry or exit. Maxum deadbolts offer maximum protection with solid–brass construction, along with anti–drilling and anti–prying features.